Absorbed Glass Mat (AGM) Batteries completely eliminate the hassles of conventional battery maintenance. There is no liquid acid in AGM batteries. All of the acid is absorbed into the compressed glass matting in the cells. They are completely Non-Spillable, so they can be shipped by mail or courier service with no hazardous warnings or extract fees. Likewise, they can be mounted in any position for special application. How do I charge an AGM Battery? AGM batteries should only be charged with AGM compatible chargers. Please view our full XS Power 1004 16V and 1005 12V/14V/16V charger manuals for complete instructions. Could you explain “MAX amps”? CA and CCA have been used since 1914 as a definition for battery performance. CA is defined as a measurement of the number of amps a 12 Volt battery can deliver for 30 seconds at 32°F and not drop below 7.2 volts. CCA is the same test at 0°F. These tests were meaningful for the cars of yesteryear that had to be cranked for a long time to get started. Back then CA and CCA numbers were very meaningful; however, for mobile audio use, immediate burst output is more important. XS Power batteries, when compared to the batteries of yesteryear, deliver much more power more quickly. This instant burst energy is what we call “MAX amps”. Could you explain “amp hours”? People often wonder what the term “amp hours” means when referring to batteries. Many people assume that “AH” (amp hours abbreviated) is a standardized rating for a battery’s ability to discharge current; a true statement. The actual method for de terming the AH rating is more often times not fully understood by the automotive enthusiast. AH capacity is measured in hours. AH is most commonly used to rate deep-cycle type batteries, or any type of battery used for relatively low discharge rates across an extended period of time. Most batteries, including XS Power batteries, are tested in a 20 hour cycle. AH tests can be performed for 10 hour cycles at a higher amp load, but results are not as useful for determining long term capacity. An AH test can easily be conducted by the end user, which is why we at XS Power are so adamant about strict honesty regarding all of our battery ratings. To conduct your own AH test, simply calculate 5% of the AH capacity, and use that number as the amp load. Make sure the battery maintains the standardized 25°C temperature for the duration of the test. The idea is that the battery needs to maintain that load for 20 hours without falling below 10.5 volts. Please note that 16 Volt batteries would be tested to 14 Volts. What does BCI Group Number mean? It should be noted that the BCI (Battery Council International) Group Number does not designate a battery’s capacity, it merely defines the above listed physical characteristics. Could you explain reserve capacity minutes? Reserve Capacity is yet another standardized battery rating useful in selecting the proper battery. Usually abbreviated “RC,” reserve capacity is measured in minutes. Battery Council International defines RC as: “the number of minutes a new, fully-charged battery at 80°F (27°C) can be discharged at 25 amps and maintain a voltage equal to or higher than 1.75 volts per cell.” This works out to 10.5 volts for a 12 Volt battery. For example, the XS Power S925 battery has a rated RC of 55 minutes. This means that with the S925 starting at a full charge at 27°C, it can maintain a 25 amp load (similar to a large cooling fan) for 55 minutes before battery voltage drops to 10.5 volts. It is easy to see how this rating is very important in determining how well a battery will operate accessories in the event of a charging system failure, if the vehicle is not properly equipped with an alternator or if the vehicle’s engine is not running. How do I determine the state of charge of my battery? 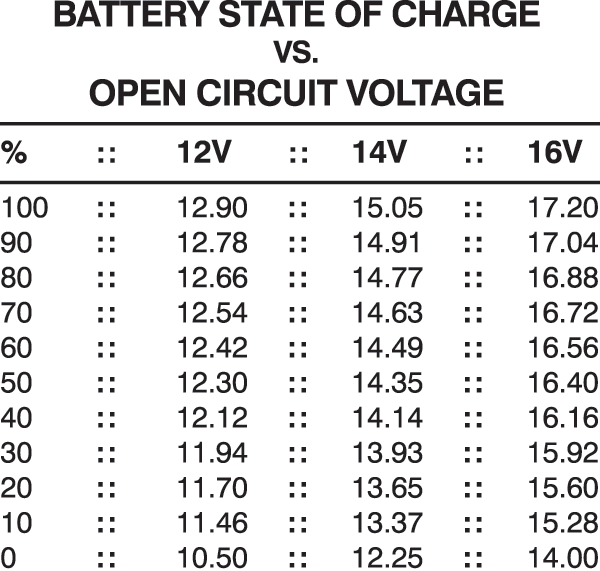 By measuring the open circuit voltage (OCV) of a battery that is not connected to any loads, it is possible to determine what percentage of capacity is remaining by referencing the chart below. Are all 16 Volt batteries tested alike? Unfortunately, no. XS Power is a member of BCI (Battery Council International) and tests all our batteries to BCI specifications. We test our 16 Volt battery to 16 Volt specifications. Other suppliers of 16 Volt batteries test to 12 Volt specifications. If XS Power batteries were tested the same as our competitors, our CA numbers would be considerably higher. Why do XS Power batteries cost more than flooded batteries? XS Power batteries are manufactured using only virgin lead, 99.99% pure compared to most batteries that use recycled lead. The pure-lead design means better performance. In other words, MORE POWER! Grids are thinner. This allows for more grids which means more surface area in a smaller package. More surface area means MORE POWER! AGM (Absorbed Glass Mat) design means longer life, vibration resistant, deep cycle and can be mounted in any position (except upside down). We believe that to create a superior product you must have a vast knowledge of your product offering. For this reason we have invested a great deal of time and money into the development and understanding of our batteries and the markets we supply. This task could not be completed with run-of-the-mill test equipment. We worked in cooperation with one of the worlds largest and prominent battery testing equipment manufacturers to develop a one of a kind test lab that would enable us to duplicate circumstances realized in real world battery applications. Our battery tester is capable of being programmed to simulate a wide range of scenarios like the dynamic current loads from an amplifier for daily driving, or the insane power demands from top sound pressure competition vehicles. We are convinced that in-depth testing and quality control is a must for any manufacturer that is serious about delivering quality batteries to the mobile audio market. Buy from the people who understand both the market and the product – XS Power! Get more continuous amps for less weight! Why drag around extra weight for less power? XS Power batteries design allows for extreme amounts of discharge current, as well as super fast recovery and recharge rates. XS Power batteries are ideal when you want to add that extra boost for your stereo without having to upgrade the entire electrical system. Don’t let the small size and weight of XS Power batteries fool you. The cranking power of XS Power Batteries can be two to three times the power of a flooded battery of equal size. Take for example the XS Power Battery Part Number S925. It will often out perform and last longer than the bigger battery that comes original equipment on a new car. This makes XS Power the ideal battery for race cars, street rods, and daily drivers. Since there are no external vents on an XS Power battery, there is no fear of mounting it in a passenger compartment, below a seat, or inside a glove box. No leaks mean no corrosion or damage to chrome or paint. We are so confident in the safety of XS Power batteries that we guarantee no acid leak even if damaged. Rigorously tested to withstand insane amounts of vibration allows XS Power batteries to be installed inside the harsh environments of the trunk or hatch areas where sound vibrations can ruin the average battery. The perfectly sealed design of the XS Power AGM Batteries allows safe, maintenance free operation, allowing them to be used in nearly any position without sacrificing life expectancy or performance. This means there is no need to constantly check and refill the electrolyte and no more corroded terminals to clean! XS Power Batteries are perfect for show cars or situations where the batteries are left unused over a long period of time. A fully charged XS Power battery can sit for up to a year at room temperature and still have the power to produce when you’re ready. Built to last, XS Power Batteries have the ability to stand the test of time. Engineered to provide 10+ years of float service and to endure more than 1000 discharge/recharge cycles depending on the average depth of discharge.